Happy New Year to all you cats and kittens out there from your Administrator of Excellence, Edgar Excellence! As I write to you, or rather dictate this message (typing is hard with paws), it’s snowing. Normally the chilly weather makes me want to curl up and take a nap, but I’m so excited for our next show that I can’t sleep! In 2015, the EPW roster was hungry for competition. Every show reflected that, starting with “Reservations for Two” in January right through to “20% Gratuity” in November. Together with our special guests, like Tessa Blanchard, Ricochet, BLK Jeez, and The Batiri, the entire EPW crew’s hard work and dedication made our year a delicious and purrfect success. Everyone in our office stretched out their creative muscles as well. We held a special event called “Excellence Live” in August, which is only available to watch on our YouTube page and was never released on DVD. “Excellence Live” featured the “Excellence Accelerator Round Robin”. We also introduced our “Turkey Tumbler Elimination Match” at “20% Gratuity,” which featured 12 wrestlers competing for more Excellence Championship Series (ECS) wins. The Excellence roster has been competing for wins in the ECS and the first eight men to get ten will enter the tournament to become the first Excellence Champion! Our big silver belt was designed by Darren Championship Gold and formally unveiled at our last show, “20% Gratuity”, where it was heavily guarded by security. At our last show, Hallowicked defeated Icarus to become the first wrestler to qualify for the tournament in the main event. 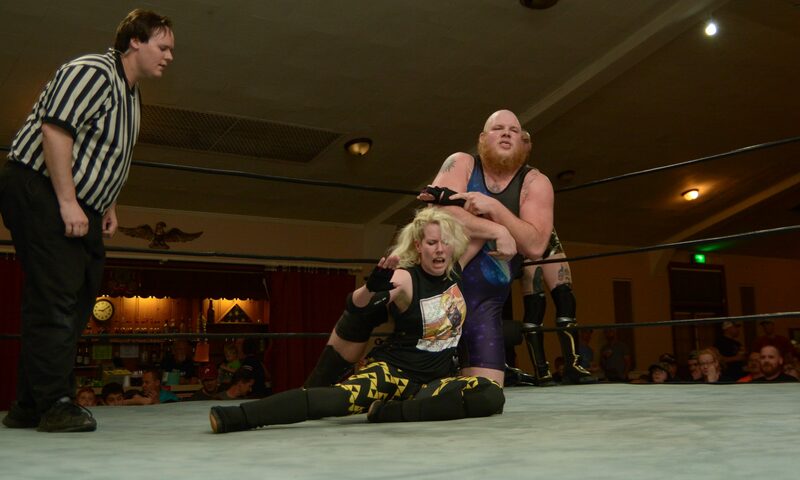 After the match, Blind Rage, frustrated by his recent losing streak, attacked Icarus. The attack led to a huge brawl that emptied the locker room. As the fighting spread around the Forrest Lodge, Wicked celebrated his win over the chaos, confident he will be our first champion. The current ECS standings are as follows: Smiley and The Boar of Moldova have nine wins, then Dan Champion and Gran Akuma are neck and neck with eight wins, followed by Icarus and Oleg the Usurper with seven, and Ken Broadway and Rage with five wins each. We ended 2015 on a high note with our highest attendance ever, as over 200 EPW fans were in attendance at “20% Gratuity”! We hope to see all of you this Saturday at “Let The Cat Out Of The Bag”. Excellence fans, we’ll be back at our home at the Forrest Lodge VFW in Sellersville, PA, and I’ve signed seven huge matches! In women’s action, the debuting Karen Q. will be taking on Vanity! In two singles contests, The Boar of Moldova will fight Kobald and Hallowicked will wrestle Argus! “Ca$hflow” Ken Broadway and the Ecuadorian Aristocrat Juan Francisco de Coronado will wrestle EPW’s favorite chef’s Too Many Cooks (Sloppy Joe and Assistant Chef Blackmon) in a tag team match! In a “Four Man Elimination Match” for ECS wins, Danger Jameson, Qefka The Quiet, Havoc, and Rembrandt Lewis will collide. The rivalry between Champion and Akuma continues on. After meeting in the “Turkey Tumbler” last November, they will wrestle one-on-one! The war between Nick the Silent Assassin, his manager Ariela Nyx, and undefeated One Night Only (Marq Quen and his friend Anthony Gangone) rages on! Originally, Nick and his partner, Matt Sells, were scheduled to take on ONO, but Matt will be with Ring of Honor and Nick will need to choose a new teammate. In this war Nick has decided to team up with Arielya Nyx’s first client, “The Psycho Superman” Smiley! What will will Smiley bring to the table against Excellence Pro’s Dynamic Duo? Also, “The Winged Ring Warrior” Icarus, and Blind Rage will be in the building! There’s some bad blood that’s been brewing since November! The question is not will these two elements explode when in the same building, but how large the path of destruction will be around them! On February 6th, Excellence will be a part of the 4th Annual National Pro Wrestling Day (NPWD) at the Goodwill Beneficial Association in Reading, PA! Team Akuma’s Ken Broadway will be in the Young Lions Cup XII tournament. Plus, we will present a match. Havoc and Danger Jameson will team up to take on One Night Only! I am very proud we will be a part of this event, as everyone at EPW also believes that pro wrestling can change the world! NPWD is free to the public, but donations will be accepted for this year’s charity, The Polaris Project, which helps fight human trafficking. Don’t forget to friend me, Edgar Excellence, on Facebook. I promise not to bite or scratch! Also, visit our website at www.excelleceprofessionalwrestling.com frequently for more Excellence updates and missives from me, the Head Cat of Excellence! If you love Excellence and need a fix before “Let The Cat Out Of The Bag” or just want to catch up before the show? We have a Facebook Page and Twitter, so be sure to like and follow us. We also have a YouTube Channel featuring footage from “20% Gratuity”, “Excellence Live”, 5 Minute Matches, and videos featuring the stars of EPW.